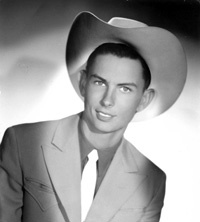 Don Lunn was a young nineteen year-old singer who answered radio station KCUL's advertising for singers for a new show that would become the KCUL Cowtown Hoedown. He stated in an email that he only appeared on the show in 1957. He indicated that due to music industry restrictions, each singer was only allowed to appear on the show twice a month, unless they had an opening that needed to be filled. The show itself appears to have only through 1961 as an article indicated that it had met its demise in 1961. The show took place at the Majestic Theatre. Don stated it was a beautiful theater that could audiences up to 3,500. It started out with vaudeville shows and evolved. The theater was torn down in 1970 to make room for the Tarrant County Convention Center at 1101 Commerce Street in Fort Worth. We asked Don what were some of his favorite memories in his music journey. He related it was getting to meet the more established stars such as Johnny Horton, Frankie Miller, Tony Douglas and Sonny James. 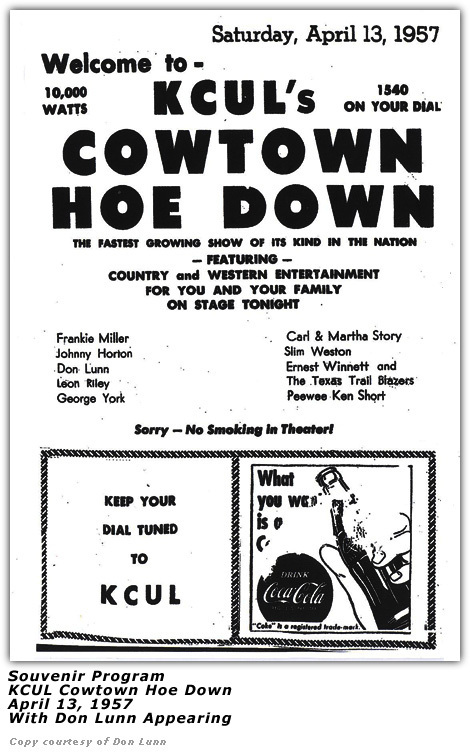 When Don was on the Cowtown Hoedown, he sang mostly Hank Williams song as he did not do any songwriting. He passed along an undated article of one of his appearances in a "Townbeat" column. "Ah, the spirit of Hank Williams lives still in the voice of Don Lunn, boy troubadour. Don not only sings like Hank but plays like Hank! Don sang at WBAP's Country Road Show at North Side Coliseum last weekend and was named first place winner in the contest. As Don won first place, he appeared on the broadcast portion of the show at 11:45 p.m.
That WBAP Country Road Show appears to have been Saturday, October 22, 1954 based on a flyer provided by Don himself. 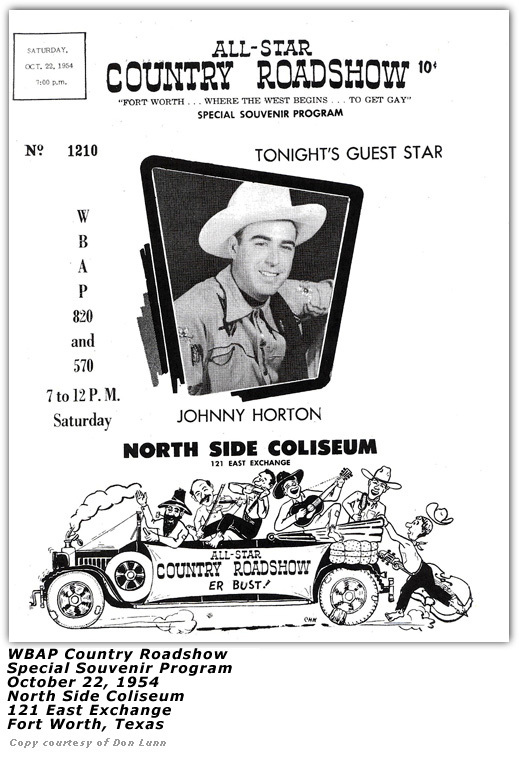 Johnny Horton was the featured act on that show. Per the program, admission price was only TEN CENTS! Earlier in his career, from 1953 to 1960, he sang in high school on the Nat Fleming Show and also the Dixie Boy Jordan show, both which aired on Wichita Falls television. As a note, researching some of the 1950's television logs, Nat Fleming was on KFDX-TV (channel 3) out of Wichita Falls. The show at one time occupied the 10:00 pm time slot. Dixie Boy Jordan's show aired at 2:30 pm in the afternoon over KWFT-TV (channel 6) on Thursdays at one time in 1956. In 1954, some logs showed the show at 4:00 pm on Fridays. Next stop after high school was in Lubbock, Texas where was part of a little band that sang two nights a week at the Rainbow Inn. In Fort Worth, he would sing on WBAP-TV and KFJZ-TV to promote the TCU Rodeo. A representative from Lone Star Beer saw Don at a talent show and offered him a job to sing at meetings, rodeos, etc. But because he was only 19 at the time, he was required to have his parents' permission to do so. But Don indicated that his mom would not sign. It might have been a break for him. 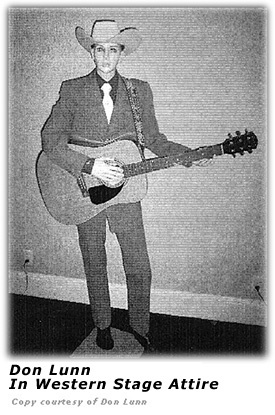 But he also mentions that Elvis had come on the scene, Rock and Roll, American Bandstand, country music shows lost popularity with such shows at Cowtown Hoedown, Big D Jamboree and eventually the Louisiana Hayride closing as well. On March 21, 1957, the local Olney Enterprise ran an article touting Don's appearance at the TCU Rodeo. It mentioned he was a freshman at Texas Christian University and had appeared on Channels 11 and Five on different days of the week to help promote TCU's Annual Ranch Week. 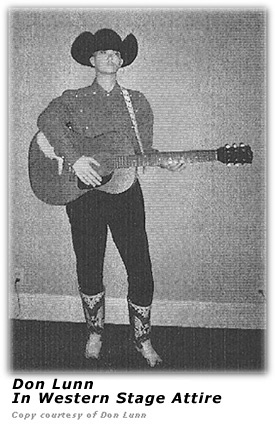 The article further mentioned that he had performed in front of audiences during and since his high school days and told readers he was a member of the Cowtown Hoedown. Don followed his father and grandfather into the funeral home business. After attending TCU, he attended and graduated from the Dallas Institute of Mortuary Science in 1958. He also completed a two year apprenticeship at the Lunn Funeral Home before passing the State Board of Morticians embalming exam. In December of 1958 he received his mortuary diploma after completing the course of study for funeral directing and embalming. His grandfather had graduated from the school in 1913, while his father graduated in 1933. Don is married to the former Laura Walters, daughter of Mr. and Mrs. B. L. Walters and make their home in Olney. Hillbilly-Music.com would like to thank Don Lunn for contacting us and answering our inquiries by email.